Twin Speak:DressCode: Jeggings, Shresses and WTF? Fleels? Spork. Jeggings, Shresses and WTF? Fleels? Spork. The image and text above is from Style.com. 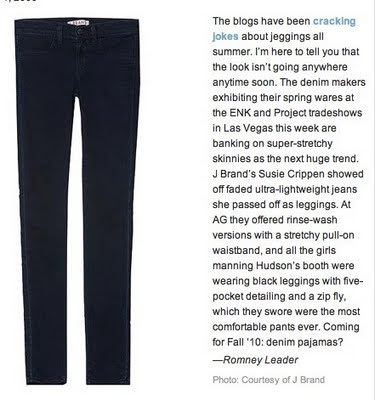 They are predicting that "Jeggings," a hybrid of jeans and leggings are going to be a must-have for fall. You can wear your "Jeggings" with a "Shress," a garment that straddles the fence between a shirt and a dress. Next thing you know, somebody will make a combination of flip-flops with heels and call them, "Fleels." Make sure your "Jeggings" match your "Shress" and your "Fleels." Okay! Speaking of combos, fast-food joints have merged cutlery's basics, the spoon and fork, into "Sporks" for some time.